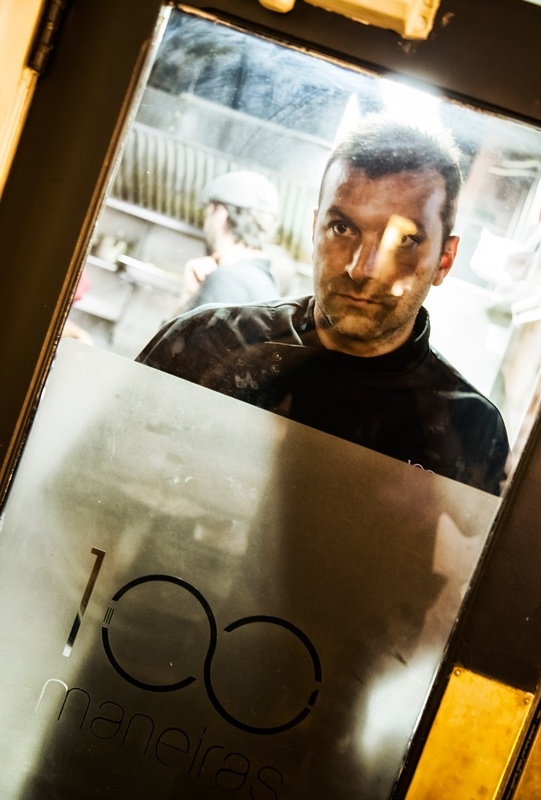 LJUBOMIR STANIŠIĆ, BORN IN SARAJEVO, 1978, OWNER OF THE PRESTIGIOUS RESTAURANT CHAIN “100 MANEIRAS” IN LISABON, WAS AWARDED BY MANY SEVERAL PORTUGUESE AND INTERNATIONAL CULINARY PRIZES, SUCH AS “GOURMAND WORLD COOKBOOK AWARD” AND “ACADEMIA INTERNACIONAL DE GASTRONOMIA”. 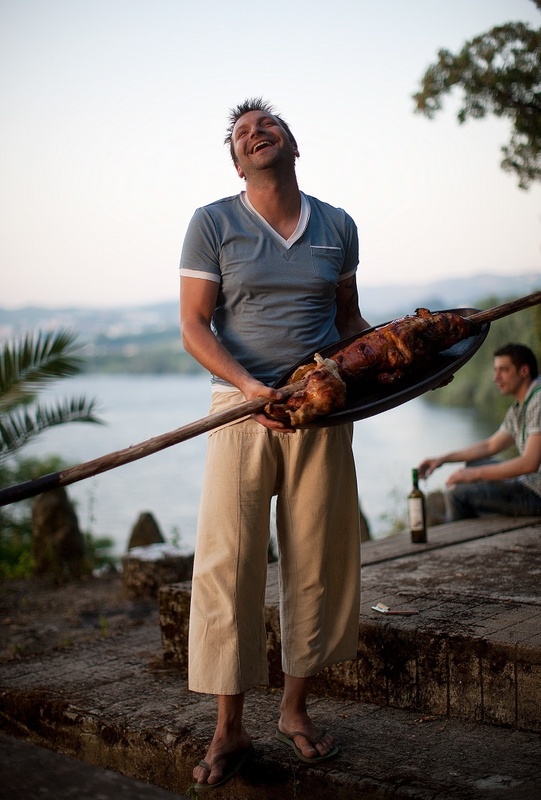 HE IS THE AUTHOR OF SEVERAL BOOKS FROM THE FIELD OF GASTRONOMY AND COCKTAIL MAKING, INCLUDING: „PAPA QUILÓMETROS – PORTUGAL“, „PAPA QUILÓMETROS – EUROPA“, „100 COCKTAILS – 100 MANIERAS“. IN SPRING 2012, THE ADVENTURES OF HIS FIRST BOOK JUMPED TO THE SMALL SCREEN, WITH THE TV SHOW PAPA QUILÓMETROS, BROADCAST BY FOX INTERNATIONAL CHANNELS – FIRST IN PORTUGAL AND THEN A LITTLE THROUGHOUT EUROPE. 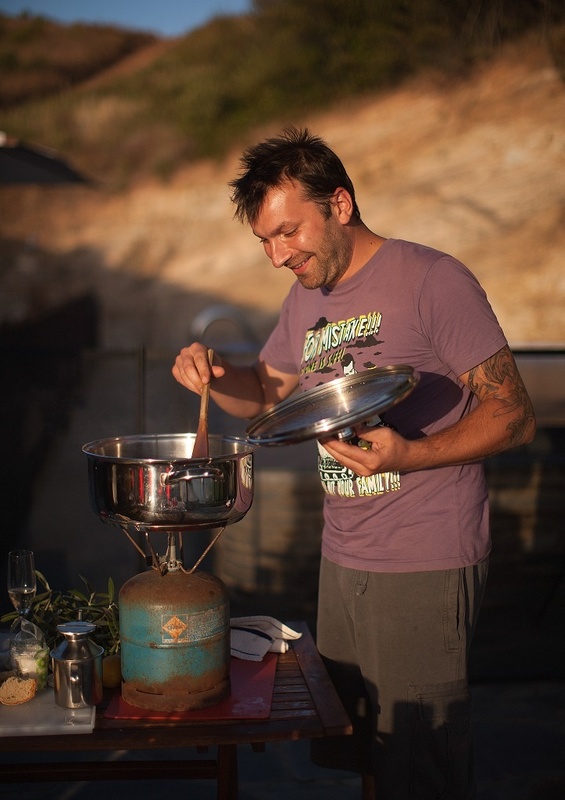 HIS COOKING STYLE EMBRACES MEDITERRANEAN AND PORTUGUESE CUISINE, BUT HAS ROOTS IN THE BALKAN COOKING TRADITION AS WELL. LJUBO (AS PORTUGUESE CALL HIM AS WELL) IS MARRIED TO THE JOURNALIST MONICA FRANCO AND IS FATHER OF TWO SONS. MY OLD SCHOOL FRIEND WELCOMES ME AT HIS RESTAURANT WITH THE SAME SMILE OF MANY YEARS AGO, AS WE ARE EATING “POLVO ASSADO”, GRILLED OCTOPUS, AND SIPPING THE PORTUGUESE “VIÑO VERDE” A WHITE WINE WITH A GREENISH NUANCE OF COLOR. HIS RESTAURANT OVERLOOKS ONE OF THE BUSIEST LISBON STREET, ALWAYS FULL OF VIBE, WHILE WE ARE TALKING ABOUT GROWING UP IN THE BALKANS, LIVING IN LISABON, FOOD AS LIFE FUEL AND CREATIVITY IN ITS PREPARATION. I HAVE JUST READ IN A TEXT THAT THEY DEFINE YOU AS A “YUGOSLAV-PORTUGUESE ENFANT TERRIBLE” AMONG CHEFS. FROM THE SCHOOL DAYS, I REMEMBER YOU AS SOMEONE WHO WOULD KNOW HOW TO FIGHT, BUT ALWAYS TO PROTECT YOURSELF AND OTHERS. ARE YOU REALLY A BAD BOY AMONG CHEFS? (laughing) You know me well from my childhood! No, I’m not a bad boy. But I’m still a fighter, fighting for my rights and for the rights of those around me. I guess that’s why they call me “enfant terrible”. And also, probably, because I always speak my mind and I do things my own way. WHAT IS THE BEST – FROM GASTRONOMY AND LIFE EXPERIENCE – THAT YOU TOOK WITH YOURSELF FROM BOSNIA AND THE BALKANS? IS IT POSSIBLE TO LINK TWO CULTURAL (AND COOKING) TRADITIONS? PLEASE TELL US SOMETHING ABOUT YOUR ARRIVAL TO PORTUGAL AND ABOUT THE ROADS THAT LED YOU TO THE IDEA OF MAKING YOUR FIRST RESTAURANT AND – TO YOUR WIFE MONICA. Of course! I’m about to open a restaurant that combines Bosnian and Portuguese influences, which are my two culinary worlds. I’m taking a lot from Bosnia, like the tableware and some traditions, and crossing it with Portuguese culture. When I got to Portugal, in 1997, I was still a bit messed up from everything that had happened during the war. Here, I found a peaceful country, culturally very similar to ours, which made me feel at home. I tried leaving many times, in the beginning, when I wasn’t able to find professional success. But after I was able to open my first restaurant, I started looking at things in a different way, with a new responsibility. It was also here that I found my wife, Mónica Franco, and that I created a family, with my two sons. IN WHAT ASPECT IS THE FOOD, AS MUSIC, NOT ONLY LIFE FUEL BUT A COMMON LANGUAGE AS WELL? I think food and music are deeply related. When you eat, you can hear the crunchiness in the food, the sound of glasses toasting… There is not a single country that doesn’t enjoy eating. Can there be anything more universal than this? You don’t need to speak to say you’re enjoying food: you smile, you make sounds (like when you bite something so tasty you can’t help but say “yummm”), it’s perfectly possible to share a great meal with someone who doesn’t speak the same language. I think that’s part of what makes food so special. WHICH WORDS COULD DESCRIBE BEST THE „À LA LJUBO“ APPROACH TO COOKING? Irreverent, no-rules, risky, strong, flavorful, sensible, elegant, intense. WHAT KIND OF FOOD DO YOU PREFER TO PREPARE – MEAT, FISH, VEGETABLES? WHICH TYPICALLY PORTUGUESE TECHNIQUES OF COOKING DO YOU APPLY? Fish and veggies, always. Actually, this year I opened a vegetarian restaurant in Douro, at Six Senses Douro Valley hotel, where I’ve been working as a consulting executive chef for almost 2 years now. It’s named “Terroir” and is the first vegetarian restaurant of a chef, in Portugal. Lately, I’ve been super interested in vegetables, in finding new creative and sustainable ways of cooking without missing any flavor. I typically apply all the Portuguese manners of cooking. The most important ingredient, however, is called “love”. COOKING IS BECOMING MORE AND MORE A MEDIATIC SHOW. IN MANY TV SHOWS WE CAN SEE “COOKING MATCHES”… CAN ONE REALLY COOK WHILE THE SAND WATCH IS EXPIRING AND IS THERE TIME FOR SLOW FOOD TODAY? In a kitchen is super important to keep calm and be careful while cooking. Dedicating time to a dish is part of what makes it taste so good. But, obviously, in a restaurant, time is always limited and that’s why preparation is so important. Yes, Anthony Bourdain was in my restaurant when he came to Lisbon. He chose us to be a part of this episode and it was great. I think traveling and eating are deeply connected. The more we travel and the more we eat from different cultures, the richer we become. So I live to eat – I don’t eat to live. COULD YOU TELL ME SOMETHING ABOUT YOUR FAMILY, WHO IS THE MAIN COOK AT HOME? DO YOUR BOYS SHOW AN INTEREST FOR QUALITY FOOD AND COOKING? My sons already show a great interest for food. The younger (5 years old) still has some complaints regarding his vegetables and he doesn’t like to have anything green on his plate. My older son (11 years old) is already a real “foodie”, he can eat more than I can and he already enjoys tasting wines. When I’m home, I always cook for my family, with my kids around me and helping out. But my wife is also a great cook.